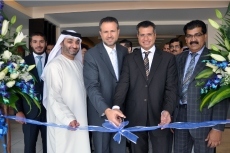 Abu Dhabi, 10 September, 2013 – Finance House P.J.S.C (FH) announced that it has opened a dedicated Trade Finance unit in its Dubai branch. This move comes to address the growing demand on these services and provides customers with a faster processing time for their operations. Trade Finance is a comprehensive solution through which Finance House offers a bouquet of services, including letters of credit, bills for collection, letters of guarantee and others. “Offering Trade Finance at our Dubai branch simply reflects our ongoing commitment to deliver easy and streamlined solutions to our customers and to keep pace with the massive growth that the Emirate is witnessing on many levels,” said Khaled Abdel Azim Hassan, Trade Finance Manager at Finance House. A prominent factor of this growth is Dubai’s bid for Expo 2020, one of the world’s largest and most anticipated events. As competition heightens to host this prestigious exhibition, Dubai is ramping up its efforts to showcase its capabilities and unique advantage as a fierce competitor. “As a local leading financial institution, we always endeavor to contribute to the economic development of the UAE. Therefore, we shall constantly look for ways to serve our goals, while providing the best to our customers,” concluded Khayata. Earlier this year, Finance House won the Best Corporate Finance Company Award for the second consecutive year at the Banker Middle East Industry Awards 2013. Being responsive to the market needs is one of Finance House’s key objectives. By providing a comprehensive range of products and services, the Company is keen on offering a unique and highly convenient financial experience to its customers.